"At the end of the day, what you get when you combine the effectiveness of Nero Video with its extremely low cost and the suite of other programs it comes along with is an incredible value. Especially if any of the other tools which come in Nero 2017 seem like they could be of use to you, I would highly recommend you get it today." "In the world of CD burning, you won’t get a more comprehensive solution than Nero Burning ROM. 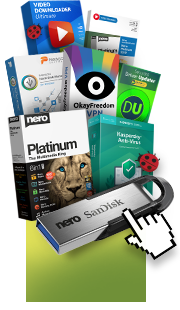 This software has nearly every feature we look for in this category..."
Nero 12 - The tools are solid and simple enough for any novice or advanced media enthusiast. "At a $129.95 list price (and $109.95 on Nero’s site), the value is extraordinary." "Nero 11 provides a lot of bang for the buck…"
"With its latest version, Nero wants to become the software you use to organize and share your digital life." "What makes Kwik Media stand out is that it creates a single location for performing all of the tasks that your separate programs handle now"
"...it is a top-notch tool that does what it does very well." "Nero took a great suite of programs and made it even better." "...newer versions of Nero have increasingly focused on multimedia and the latest version 10 is no exception." "Tons of apps in this suite for handling almost every multimedia project you can think of." "... unlocking a complete HD experience for creative enthusiasts and home hobbyists alike." "... is built upon the current Multimedia Suite 10, but with a big focus obviously on the HD portion of it." "... an in-depth application that allows you to create professional movies or slideshows." "...delivers smokin' results without burning down the budget. Nero Multimedia Suite 10." "With its new software products, Nero is now delivering video editing solutions for semi-pros and amateurs..."
Tekzilla reviews Nero Multimedia Suite 10 with 2 thumbs up! "...Nero BackItUp surprised us with some advanced features." "...video editor now a full-fledged multi-track editor; GPU acceleration in video editor..."
"You can use Nero DiscSpan to copy it to multiple discs. You can even mix disc types." Nero Multimedia Suite 10 - "will grant users a powerful solution"
"At this point we can say that the version 10 of Nero Burning Rom is a big step forward, starting from the fast loading..."